I love where the paper bubbled, the texture looks amazing ! I see you are still looking through yellow color glasses! Is this the color you used on your bookcases? Please share some photos- would love to see what you have created! Love that head on the spread-very cool pages! 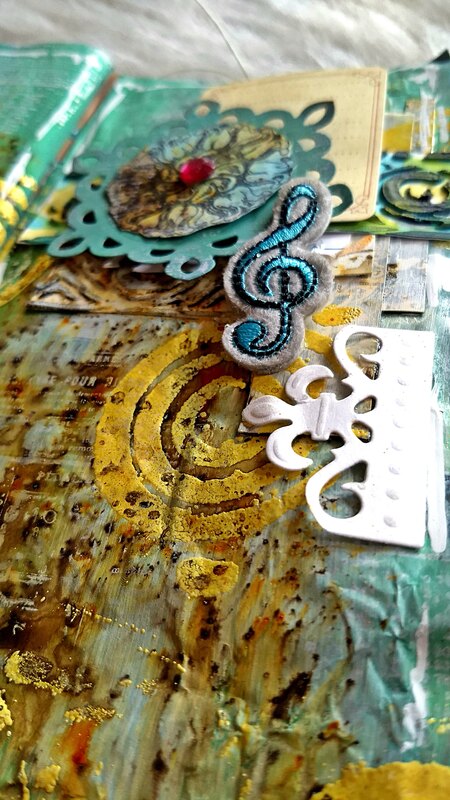 brilliant Colors, i love all the texture you used on your journaling spread! happy t-day, have a great week! fabulous page Kate! So many layers and imagery to admire. How exciting to see your new craft room coming together. Happy T day! The texture and colours and the layering – beyond beautiful Kate! GORGEOUS!!! I hope you will share a picture of the renovation in the end – always much work. I have a big room upstairs, but I can’t use it as craftroom since one of my both dogs is a bit too old for the steps but the dogs always want to be with me the whole day – so I am in the living room for crafting – even though I would have this big room — that’s a bitter fate but I love my dog as much as it would be my child. It’s a boy and he grew up with my daughter, so he is my “son” as well and he loves me over the moon and I love him. 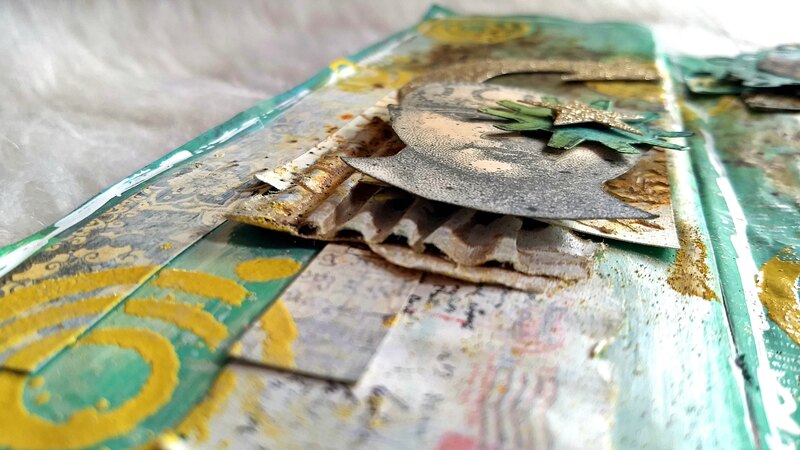 Its a wonderful interesting journal page, fantastic details and layers. You must be so pleased to see progress in your new craft room. Look forward to seeing a photo. Thanks for joining us at Country View Challenges this month! I apologize for taking so long to visit. I’ve had internet woes and just got back online. I chhhhecked out your Pinterest page and noticed that all the fabric storage was set up for large pieces of fabric. I seldom purchase over 4″ to 8″ of a piece of fabric, unless it’s tulle. I’d love to know how others deal with their small scraps. And of course, I want to see your craft room as it progresses, too, PLEASE. Not just when it’s completely finished. You can make journal pages from the progress, too, like I did with my kitchen remodel in an altered book. Your journal page is wonderful. I am in awe, as always, with the amount of layers you get with each page. My pages are always so flat. I want to come visit you and take lessons on how you put your pages together from the beginning. Guess I’m a visual learner (grin). Thanks, too for joining us for T this Tuesday. 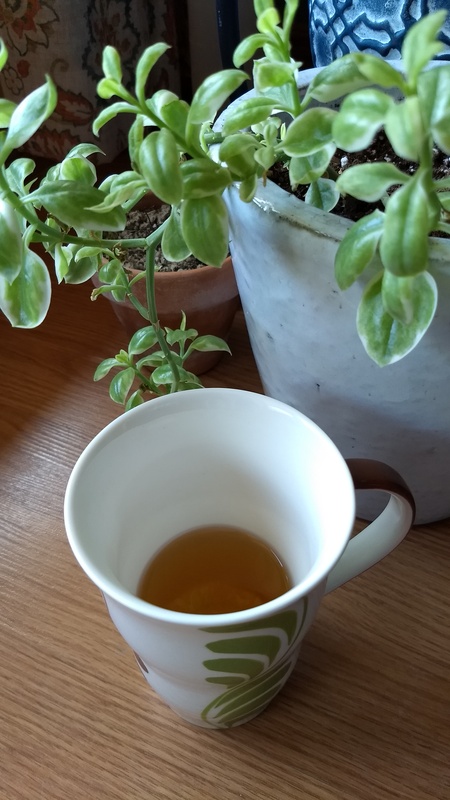 I am curious as to the plant you shared with the tea, too. Sorry for a late reply. I love the idea of making a journal of the progression. Thanks for the idea. What a beautiful journal page! I had a great time checking out your Pinterest page, and drooled and dribbled over those impossibly gorgeous craft rooms. I liked the idea of hanging up projects in progress. I also like the Tim Holz rotary lazy susan type thingy. Anyway it is so exciting that your hubby is doing so much and that soon you will have a fab craft space. Please show us pictures. Please pretty please…. A fabulous spread with fantastic textures, – such a great lay out, the finihsing touches are brilliant! Your journal pages (also the ones below) are amazing! I love the colors and layers and beautiful lay-outs! Gorgeous journal page, Kate. I love all the die cuts and layering, as well as the color scheme. Pretty pictures of my craft room? There are none 😉 It ain’t pretty but it works for me. Fabulous journal pages!!! Great colours and textures!!! Thank you for joining the January challenge of the Country View Challenges! Intriguing journal pages, Kate! I love the layers and your color choices are beautiful! Those yellow spirals remind me of the sun and the blue in the background – a Carolina blue sky! Love all the texture and your amazing ability to layer! I am delighted you are playing along with our Three is Not a Crowd challenge at Frilly and Funkie! Those spirals are a great way to show off those 3’s! Hugs! Beautiful and inspiring as always! Love seeing how you layered up the paints and texture. Your new craft space sounds inspiring! 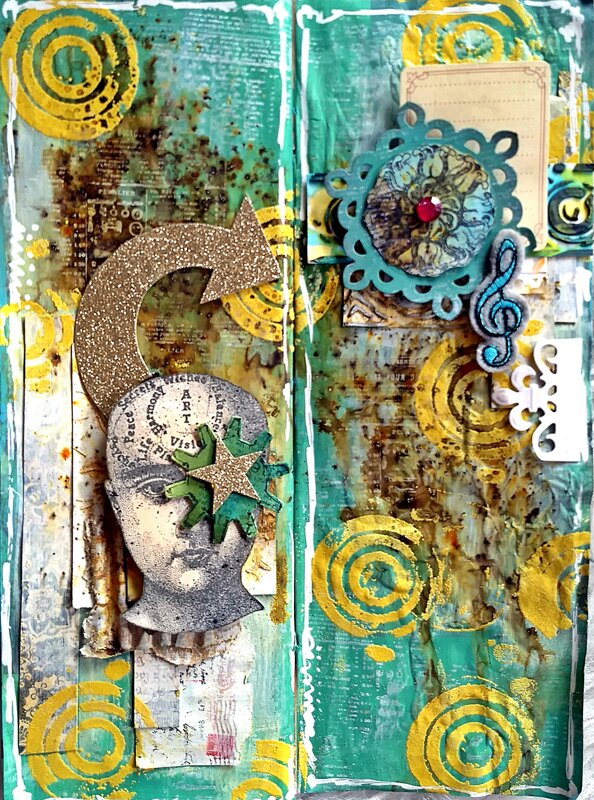 Love the fun colours you have used in this journal page and all the wonderful layers create texture. Thanks for joining us at Frilly and Funkie.